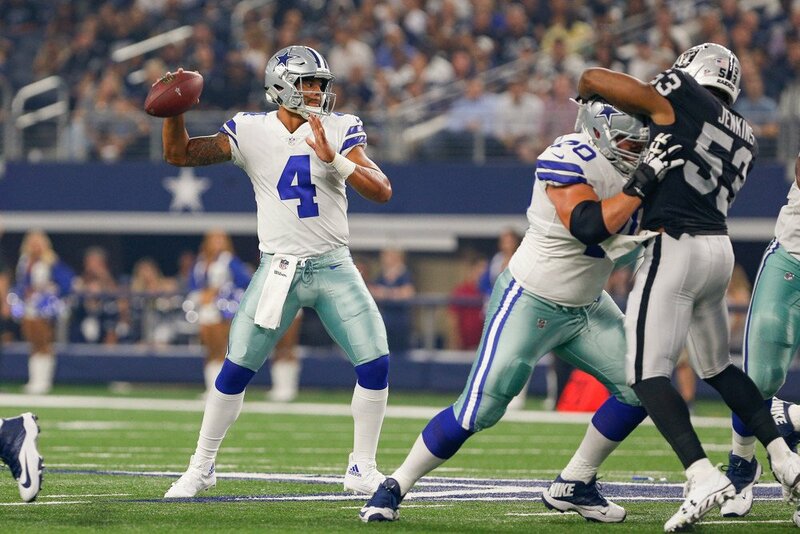 Dallas Cowboys’ quarterback Dak Prescott had a surprisingly good rookie season in 2016, completing 311 passes out of 459 attempts (68%) for 3,667 yards, 23 touchdowns, and 4 interceptions. He added 282 yards on 57 rushing attempts and ran in 6 touchdowns. In standard scoring leagues, Prescott finished as the 6th ranked quarterback, ahead of veteran quarterbacks such as Matthew Stafford, Russell Wilson, and Philip Rivers. This performance greatly outperformed his 2016 ADP, where he was drafted around 12.06, or the 19th quarterback off the board. This means in many 1 quarterback 12-team leagues, Prescott probably went undrafted. Those who drafted Prescott or picked him up off waivers were not disappointed. Prescott had one of the highest completion percentages last season amongst quarterbacks, even going on a 6 week stretch without throwing an interception. His ability to run into the endzone when the Cowboys were near the goal line made Prescott an even bigger fantasy asset for owners. Prescott is currently sitting at an average draft position of 10.05 overall in 12-team standard mock drafts. Prescott is the 14th quarterback off the boards. 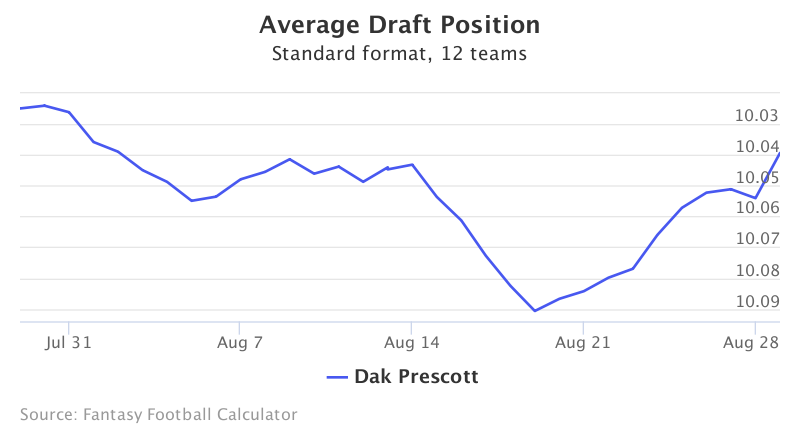 Over the past month, Prescott’s ADP has remained relatively constant, hovering around the middle of the 10th round. His highest ADP came at 10.02 in late July, and has dropped only as far as 10.09 a few weeks ago. For being the 6th overall quarterback in fantasy in 2016, his 10th round/14th quarterback ADP shows that fantasy owners are still unsure what to make of the young quarterback in Dallas. Dak Prescott may not have been the most exciting quarterback at times, but he managed a QB1 finish (~14 pts away from a top 5 finish) with few turnovers. He showed ability to run when in trouble, but also that he was smart with his passes. The offensive line hasn’t changed much, so Prescott should still see a decent amount of pocket time before it collapses. The potential suspension of running back Ezekiel Elliott shouldn’t hurt Prescott too much either, since opposing defenses will still need to plan for a decent running attack. The offensive line is so good that pretty much anyone can run behind it somewhat successfully. Be aware that the Cowboys have a tough schedule to start, with tilts against top defenses in the Giants, Broncos, Cardinals, and Rams the first four weeks. Prescott played all 16 games last season, and doesn’t appear to have any track history of injury. Dak Prescott is currently being drafted at 10.05 in 12-team standard mock drafts, good for a high end QB2. Prescott finished last year as the 6th ranked quarterback, surprising fantasy owners everywhere after the freak accident to Tony Romo. Prescott was efficient, sharp, and at times a dual threat quarterback. In order to continue/improve however, he will have to show it against some of the best defenses in the NFL. If he stays confident and gets some help from his receivers, Dak can be a top 10 quarterback once again.